Peritoneal dialysis was first used for the management of end-stage renal disease in 1959. In 1968, Henry Tenckhoff developed the indwelling peritoneal catheter, which was placed via an open surgical technique. Subsequently, percutaneous and laparoscopic techniques for placement have been utilized. An image depicting peritoneal dialysis catheter insertion can be seen below. Peritoneal dialysis catheter showing the double cuff catheter. Chronic peritoneal dialysis is an option for many patients with end-stage renal disease. The intraperitoneal administration has been used for blood transfusion, chemotherapy, insulin, and nutrition. Peritoneal dialysis catheters may be placed percutaneously, laparoscopically, or via an open surgical route. The anesthetic used will vary with the method selected. Percutaneous placement can be performed at the bedside with local anesthesia, whereas the laparoscopic or open route will require general anesthesia. Peritoneal dialysis catheters come in various shapes (straight, pigtail-curled, swan-neck), lengths, and numbers of Dacron cuffs. The peritoneal dialysis catheter is composed of a flexible silicone tube with an open-end port and several side holes to provide optimal drainage and absorption of the dialysate. The extraperitoneal component of the catheter has either one or two Dacron cuffs. The Dacron cuffs are for optimal ingrowth and fixation. In adults, a double cuff catheter is typically used. With the double cuff peritoneal dialysis catheter, the proximal cuff is positioned in the preperitoneal space and the distal cuff in the subcutaneous tissue (see the image below). The proximal cuff holds the catheter in place while the distal cuff acts as a barrier to infection. The type of catheter selected is usually surgeon dependent. Placement of the peritoneal dialysis catheter requires that the patient be placed in a supine position. Peritoneal dialysis catheters may be placed via a percutaneous, a laparoscopic, or an open surgical route. Open surgical and laparoscopic techniques are preferred because of their safety and good initial results. Although less invasive, percutaneous peritoneal dialysis catheter placement has the risks of unsatisfactory placement and bowel injury. The patient is placed in a supine position. General anesthesia is used and intravenous antibiotics are administered. An infraumbilical midline incision is made. The subcutaneous layer is dissected down to the sheath of the rectus abdominal muscle. The anterior rectus sheath is opened, and the muscle fibers are bluntly dissected. The posterior sheath is incised, and the abdominal cavity is opened after dissecting the peritoneum. The abdomen is inspected for adhesions, and, if any are present close to the abdominal wall, they are dissected. Next, the patient is placed in a Trendelenburg position, and the catheter is placed over a stylet and advanced into the peritoneal cavity. The intraperitoneal portion is slid off the stylet, and the cuff is positioned in the preperitoneal space. The peritoneum and posterior and anterior rectus sheaths are closed with absorbable sutures taking care to prevent catheter obstruction and leakage of dialysate. A tunnel is then created to the preferred exit site, which is usually lateral and caudal to the entrance site. The distal cuff is placed subcutaneously, 2 cm from the exit site. The laparoscopic approach to peritoneal dialysis placement is becoming more popular because of to its advantage of being able to perform partial omentectomy or lysis of adhesions if needed during the initial catheter placement. The patient is placed in a supine position, and general anesthesia and intravenous antibiotics are administered. Pneumoperitoneum is typically established via an open technique with a 5-mm access port in a subumbilical midline position. Diagnostic laparoscopy is performed with a 5-mm 0-degree lens. An additional 5-mm trocar is placed under direct vision at the site of the planned exit-site position of the peritoneal dialysis catheter. This is usually paraumbilical left or right 2-3 cm below the umbilicus. The trocar is advanced through the anterior and posterior rectus sheaths, but not through the peritoneum. Under direct vision, the trocar is directed into the preperitoneal space, 2-4 cm downwards and to the midline of the abdomen. If adhesions are present, the trocar is placed into the abdominal cavity and the adhesions are lysed. A double-cuffed curled tip peritoneal dialysis catheter is then placed through the paraumbilical port with the curled tip placed into the pouch of Douglas. If no adhesions are present, the second trocar is left in the preperitoneal space. A stiff stylet is then used to introduce the peritoneal dialysis catheter into the peritoneal cavity. The distal cuff of the peritoneal dialysis catheter remains outside of the peritoneal cavity and is positioned either in the preperitoneal space or between the rectus sheaths. The paraumbilical trocar is removed, and the catheter is then directed to its exit-site location. 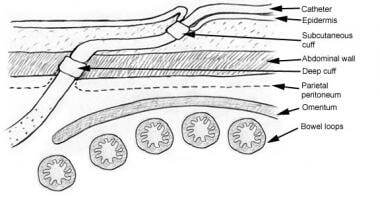 A subcutaneous tunnel is created, and the catheter is brought through the tunnel with the proximal cuff positioned within the tunnel. Percutaneous placement of peritoneal dialysis catheters with a guidewire and peel-away sheath uses the Seldinger technique. Percutaneous peritoneal dialysis catheter placement can be performed under local or general anesthesia with prophylactic antibiotics. A small incision is made above the entrance site, usually in the midline with blunt dissection of the abdominal rectus sheath. An 18-gauge needle is placed into the peritoneal cavity. Proper positioning of the needle is confirmed by filling the peritoneal cavity with air or 500 mL of saline. Absence of pain or resistance with filling suggests proper needle positioning. A 0.035-inch guide wire is then advanced through the needle into the abdomen, and the needle is removed. A dilator and peel-a-way sheath are advanced over the guidewire into the abdominal cavity. The dilator and wire are then removed, and the peritoneal dialysis catheter is placed on the stylet and advanced through the sheath. The PD is advanced until the proximal cuff is in the preperitoneal sheath. The peel-a-way sheath and the stylet are removed, and the position of the catheter is checked. The Moncrief-Popovich catheter and technique involves subcutaneous burial of the external segment of the peritoneal dialysis catheter to prevent colonization of the catheter by skin bacteria and to promote attachment of the cuff to the tissue prior to exteriorization. Longer dialysis catheters have been developed to allow placement of the exit site in remote places such as the presternal area. Such extended catheters may be useful in obese patients and in those with an abdominal stoma. Bleeding is rarely a significant problem after peritoneal dialysis catheter placement. When bleeding occurs, it is usually at the exit site. Wound infection is uncommon and often can be treated with antibiotics when it is superficial. If the wound is deeper, then it may need to be drained. Outflow failure may be due to several causes including clots or fibrin in the catheter, a kink in the subcutaneous tunnel, placement of the catheter in the omentum, occlusion from omentum, or adhesions. An attempt to irrigate the catheter forcefully with saline or urokinase can be tried, or a stiff wire can be inserted into the catheter under fluoroscopy. If there is a kink in the subcutaneous tunnel, then an incision is made directly over the kink and the catheter is repositioned. Laparoscopy is useful for identification and treatment of obstruction due to omentum or adhesions. Outflow obstruction may also occur from malpositioning of the catheter into the upper abdomen. The position of the catheter may be identified on plain film or under fluoroscopy with the injection of contrast into the catheter. The catheter may be repositioned with a stiff guidewire or forceps. Laparoscopic repositioning and fixation is an alternative. Peritonitis may occur early and manifests as abdominal pain associated with cloudy peritoneal fluid. The fluid should be cultured, and appropriate antibiotics should be administered. Outflow failure beyond 30 days may occur due to constipation and can be treated with laxatives. Blagg CR. The early history of dialysis for chronic renal failure in the United States: a view from Seattle. Am J Kidney Dis. 2007 Mar. 49(3):482-96. [Medline]. Tenckhoff H, Curtis FK. Experience with maintenance peritoneal dialysis in the home. Trans Am Soc Artif Intern Organs. 1970. 16:90-5. [Medline]. Konings CJ, Kooman JP, Schonck M, et al. Fluid status, blood pressure, and cardiovascular abnormalities in patients on peritoneal dialysis. Perit Dial Int. 2002 Jul-Aug. 22(4):477-87. [Medline]. Shetty A, Oreopoulos G. Peritoneal dialysis: Its indications and contraindications. Dialysis & Transplantation. 2000. 29(2):71-77. Rubin J, Ball R. Continuous ambulatory peritoneal dialysis as treatment of severe congestive heart failure in the face of chronic renal failure. Report of eight cases. Arch Intern Med. 1986 Aug. 146(8):1533-5. [Medline]. Konig PS, Lhotta K, Kronenberg F, Joannidis M, Herold M. CAPD: a successful treatment in patients suffering from therapy-resistant congestive heart failure. Adv Perit Dial. 1991. 7:97-101. [Medline]. Mactier RA, Dobbe JW, Khanna R. Peritoneal dialysis in fulminant hepatic failure. Perit Dial Bull. 1986. 4:199-202. Mayer AD, McMahon MJ, Corfield AP, et al. Controlled clinical trial of peritoneal lavage for the treatment of severe acute pancreatitis. N Engl J Med. 1985 Feb 14. 312(7):399-404. [Medline]. Reuler JB, Parker RA. Peritoneal dialysis in the management of hypothermia. JAMA. 1978 Nov 17. 240(21):2289-90. [Medline]. Khan IH, Henderson IS, Mactier RA. Hyperpyrexia due to meningococcal septicaemia treated with cold peritoneal lavage. Postgrad Med J. 1992 Feb. 68(796):129-31. [Medline]. [Full Text]. Peppelenbosch A, van Kuijk WHM, Bouvy ND, van der Sande FM, Tordoir JHM. Peritoneal dialysis catheter placement technique and complications. Nephrol Dialysis Transplant Plus. 2008. 1 (suppl 4):iv23-iv28. Moncrief JW, Popovich RP, Dasgupta M, Costerton JW, Simmons E, Moncrief B. Reduction in peritonitis incidence in continuous ambulatory peritoneal dialysis with a new catheter and implantation technique. Perit Dial Int. 1993. 13 Suppl 2:S329-31. [Medline]. Danielsson A, Blohme L, Tranaeus A, Hylander B. A prospective randomized study of the effect of a subcutaneously "buried" peritoneal dialysis catheter technique versus standard technique on the incidence of peritonitis and exit-site infection. Perit Dial Int. 2002 Mar-Apr. 22(2):211-9. [Medline]. Crabtree JH. Extended peritoneal dialysis catheters for upper abdominal wall exit sites. Perit Dial Int. 2004 May-Jun. 24(3):292-4. [Medline]. Park YS, Min SI, Kim DK, Oh KH, Min SK, Kim SM, et al. The Outcomes of Percutaneous Versus Open Placement of Peritoneal Dialysis Catheters. World J Surg. 2013 Dec 4. [Medline]. Io H, Maeda K, Sekiguchi Y, et al. Comparison Between the Fixation of Peritoneal Dialysis Catheters to the Peritoneal Wall and the Conventional Placement Technique: Clinical Experience and Follow-Up of a New Implant Technique for Peritoneal Dialysis Catheters. Semin Dial. 2013 Nov 22. [Medline]. Skipper K, Dickerman R, Dunn E. Laparoscopic placement and revision of peritoneal dialysis catheters. JSLS. 1999 Jan-Mar. 3(1):63-5. [Medline]. [Full Text]. Savader SJ, Lund G, Scheel PJ, et al. Guide wire directed manipulation of malfunctioning peritoneal dialysis catheters: a critical analysis. J Vasc Interv Radiol. 1997 Nov-Dec. 8(6):957-63. [Medline]. Hisamatsu C, Maeda K, Aida Y, Yasufuku M, Ninchoji T, Kaito H, et al. A novel technique of catheter placement with fibrin glue to prevent pericatheter leakage and to enable no break-in period in peritoneal dialysis. J Pediatr Urol. 2015 Oct. 11 (5):299-300. [Medline]. Fibrin Glue May Prevent Leakage Around Peritoneal Dialysis Catheter. Reuters Health Information. Available at http://www.medscape.com/viewarticle/851094. September 17, 2015; Accessed: January 13, 2016. Piraino B, Bailie GR, Bernardini J, et al. Peritoneal dialysis-related infections recommendations: 2005 update. Perit Dial Int. 2005 Mar-Apr. 25(2):107-31. [Medline]. van Diepen AT, Tomlinson GA, Jassal SV. The Association between Exit Site Infection and Subsequent Peritonitis among Peritoneal Dialysis Patients. Clin J Am Soc Nephrol. 2012 Aug. 7(8):1266-71. [Medline].